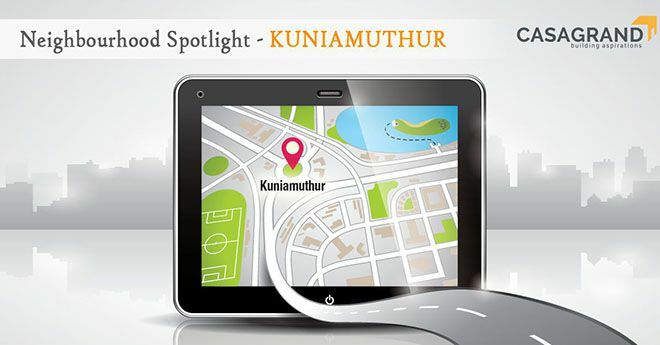 Located just 6 kms from the heart of Coimbatore, Kuniamuthur is one of the busiest markets of the city. It is conveniently located near Palakkad Road – one of the arterial roads of Coimbatore – and is widely known for its brilliant infrastructure. Read on to know why investing in real estate at Kuniamuthur is a great choice. Kuniamuthur is a huge locality divided into sub-locales such as Sai Garden, Iyappa Nagar and BK Pudur to name a few. The primary advantage of investing in this beautiful locality is the presence of major roads nearby, like Madukkarai Road, and NH-209, which provides you with excellent connectivity. Large-scale development is happening along Kuniamuthur, and other outlying parts of Coimbatore, making this the best time to invest in this prime location. When it comes to infrastructure, the area is endowed with wide roads and a well-planned layout. The pavements and roads are well-lit, making Kuniamuthur an ideal and safe location for you and your family to move into. Dotted with lakes and a few other freshwater bodies, the locality also gets a continuous supply of water and electricity. Sree Abirami Hospital Private LTD.
Neighbouring this first-class locality are some important locales such as Kovai Pudur, Eachanari and Podanur. With the Coimbatore International Airport located just 17 kms away and Coimbatore Junction as near as 6 kms, Gandhipuram located at 11 kms, it is fast becoming one of the top retail destinations in Coimbatore. There are numerous educational institutions as well located in and around Kuniamuthur making it a top-notch residential area. If shopping is your favourite weekend activity then located just 7 kms away is the grandest mall of Coimbatore – The Brookfield Mall. Kuniamuthur has a lot of great eateries and cafes as well, offering multi-cuisine delicacies which are guaranteed to leave you spellbound. Be it lip-smacking non-vegetarian food or finger-licking vegetarian dishes, you are spoilt for choice. It is now the best time to invest in Coimbatore due to the wide variety of places in Coimbatore to buy a home. The upcoming locality of Kuniamuthur offers world class potential for the development of villas and luxury apartments. Whether you are buying a ready to occupy home or planning to invest in a row house, it offers the complete package to every home buyer with great climate, less pollution and the possibility of a lake view. With such brilliant options, Kuniamuthur is one of the best places in Coimbatore to own a home in. It has some great upcoming projects such as Casagrand Aqua which is a spacious and secure gated community with new age architecture, a clubhouse and other lifestyle amenities, overlooking the serene Kurichi Lake. So, strike while the iron is hot and invest in a safe, affordable and luxurious living for you and family at Kuniamuthur.